wrapping machinery for semi automatic shrink wrap operation and can deliver over 600 packs per hour totally sealed. Robust and extremely versatile the machine can easily be wheeled around and simply plugs in to a standard 13Amp socket. 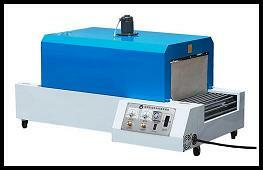 This shrink wrapping machine is very simple to use, very reliable and manufactured to usual impeccable standard. We also supply shrink wrap materials, wrapping machines and wrapping machinery, including L sealers and shrink tunnels.